Some words in the English language take a whipping every day. Here is my pick for the most abused word in the English language. He only ate the green peppers. They only had ten minutes to get there. She only wants a few firecrackers. We only ate a dozen hamburgers. “Only” is a word with an unspoken implication – that there are many possibilities, but all are false except one. In the first example above, the writer intends to say that he ate the green peppers, but he did not eat the red, yellow or orange peppers. What he has in fact said is that he ate the green peppers, but he did not buy them or store them or cut them. He only ate them. What he meant to say is “He ate only the green peppers”. 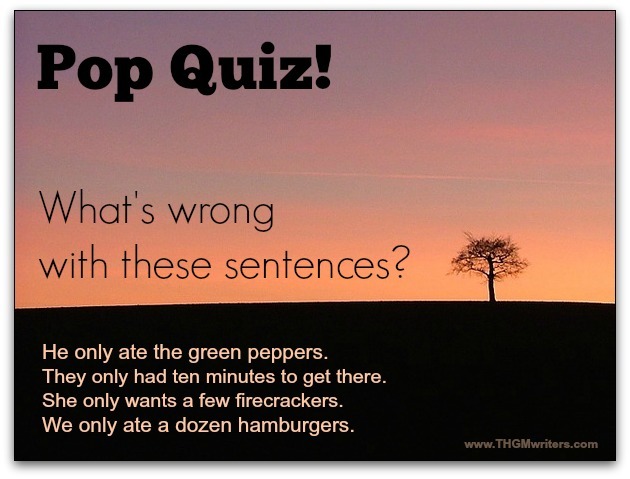 He used the word “only” to modify “ate”, when he wanted it to modify “the green peppers”. You see the difference between “only ate” and “only the green peppers”? In the second example above, the writer intends to say that they had ten minutes and no more. What he has in fact said is that they had ten minutes to get there and nothing else to help. No car. No feet. No map. What he meant to say is “They had only ten minutes to get there”. He used the word “only” to modify “had”, when he wanted it to modify “ten minutes”. You see the difference between “only had” and “only ten minutes”? Most people speak like this these days. But as writers, we are compelled to write with clarity, to say what we mean. Shall we try one more? Right. Why not? In the third example above, the writer intends to say that she wants a few firecrackers, but no more than a few. What he has in fact said is that she wants firecrackers, but she does nothing else with them. She just wants them. She does not buy them. She does not set them off. She does not watch them explode. She only wants them. What he meant to say is “She wants only a few firecrackers”. He used the word “only” to modify “wants”, when he wanted it to modify “a few”. Once again, you see the difference between “only wants” and “only a few”? I’ll let you do the fourth example yourself. Maybe it would help if I share with you a sneaky little “cheat sheet” rule. If you are not sure that you have placed “only in the right place, try this. Remove everything before “only”, so that the sentence starts where “only” begins. Then complete the sentence at the end with what you took from the beginning. Let’s do that with the four examples above. Only ate the green peppers, he. Only had ten minutes to get there, they. Only wants a few firecrackers, she. Only ate a dozen hamburgers, we. Ouch. OK, let’s try these same examples with “only” in its proper place, then taking everything before “only” and moving it to the end of the sentence. Only the green peppers, he ate. Only ten minutes to get there, they had. Only a few firecrackers, she wants. Only a dozen hamburgers, we ate. Ah…that’s better. It sounds a bit like Yoda speaking, but at least it makes sense. You might argue some other words are abused more. I will grant that possibility. Listening to my teenage daughter and her friends talk, I am sure that “like” would be a candidate. And considering how often people say “they”, when they mean “he or she”, I would concede that “they” is also a strong candidate (but that is debatable). Or when referring to a company, many people use “they” instead of “it”. Perhaps you have a favorite candidate for the most abused word in the English language. Feel free to rant about it in the comments below. David Leonhardt is President of The Happy Guy Marketing, a published author, a "Distinguished Toastmaster", a former consumer advocate, a social media addict and experienced with media relations and government reports. So true, Corey. My younger daughter uses that word like punctuation. “You are literally three hours late to pick me up.” “I am literally starving to death.” “I am literally fed up of sharing.” At least it’s better than using swear words for punctuation, though – right? What he means it that he wants new trainers because the new ones would be more fashionable and old ones look old. Actually what he means is it would be great to have bluetooth headphones. Neither of them need the trainers or headphones. They won’t die or even get cold without them! The truth is they want them. I need you to go ahead and give yourself a pat on the back because that there is the onliest word that could beat only. I have always considered “there’s” when it should be “there are” the most abused / misused word. All one has to do is listen to television commentators and interviews or read news accounts to know how pervasive “there’s” is. That is a good one, Kathleen. And so very true! Interesting article, thank you. Perhaps a word (or two …) in defence of “they” over “her” and “she”: As a writer of both fiction and non-fiction (the fiction for novels, the non-, for blogs, and other things), it is easy to see the use of “they” in writing when trying to satisfy the need for “gender-neutral” language. If writing about people, in general, it is easier, for me, to use “they” (in non-fiction) than to constantly be referring to a “royal he” or alternate between “he” and “she”, trying to keep count of how many times each has been used in order to be equitable to the two sexes. Thus, it is easier to refer to non-specific entities as “they” rather than assigning a (most often) paternalistic quality to the tone of whatever is being written. Does that make sense? Forgive me if it doesn’t, it’s relatively early in the morning. As for my vote for “most abused” … something that really annoys me whenever I’ve been listening to newscasters, or anyone else, for that matter, is the constant use of, “I mean” … no, you don’t mean, you haven’t said anything yet, how can you mean? It’s a ridiculous statement, a filler, akin to you daughter’s “like” which serves no linguistic purpose. Speaking of linguistic purpose, this all reminds me of the movie “Arrival” … the power of language is something we are all, quite sadly, surrendering to texting and tweeting. As writers we care about these things, grammar means something (at least, it should, it is the harmony of our work, the glue which holds our words together), but how many students going through the system today, students who may have aspirations of one day becoming the next “Great American Novelist” are able to cobble together a decent paragraph, let alone an entire short story. Reading some of the things being written today is, it is sad to say, like watching a society move inexorably closer to collective illiteracy (though mildly functional at that). To me the most abused word in the English language is, “Love”, it’s an action word, but when we use it, there’s nothing behind it! How can you say you love me, but you don’t show it? Dumb it down, or clear it up? "The article flows like a symphony." "THANK YOU DAVID !!! Exactly how I wanted it to flow." "Awesome! Thanks for the rewrite, its perfect." "Oh wow, I am crying. It is beautiful." "I am very very happy with the outcome!"